I was really quite frightened yesterday about what could have happened in Synod - and I stood up and said so in respons to the motion to move to next business. Later on an old friend of mine - also a Synod member - told me how he had looked at the line of people acting as Eucharistic ministers for the Communion service on Wednesday morning and thought just how fragile the bonds were that held us all together. We could have done an enormous amount of damage yesterday afternoon... but thank God, we didn't. Of course, if you ask three different people to tell you what happened yesterday you'll get at least four different answers, but the best analysis for my money is on Scott Gunn's Blog. From my own perspective, I have a few thoughts that I wanted to put on record. Yesterday morning I had a long and interesting conversation with one of the ACNA delegation who had come to observe the debate. What he told me was that ACNA wished to enter into the Anglican Communion via the Covenant process. Now that seems to me to be an entirely reasonable aim - especially, as I pointed out to him, that provided the Covenant was ratified by the Communion this would mean that ACNA's relationship with TEC would have to be the same as their relationship with the Church of England. However, if ACNA is going to present itself as the representitive of the conservative strand of Anglicanism in North America - and I think that is the only way in which it can present itself if it is going to make a serious attempt at being part of the Anglican Communion - it has a way to go yet. Scott talks about some aspects of this in his article I have mentioned above, and I would add in particular the fact that there is currently one major continuing Anglican presence in North America that is missing from ACNA. Changes in the Episcopal Church in the 1970s led to the Congress of St. Louis and the subsequent establishment of several conservative, Anglo-Catholic continuing churches. These are still operating in North America, and number more than 200 congregations - in other words about a quarter the size of the current ACNA grouping. These groups represent a style of traditional Anglo-Catholicism that is very familiar us in the Church of England - more than that they represent a tradition that I would expect to find in any conservative grouping. The fact that they are not there makes me wonder to what extent ACNA really does currently represent traditional Anglicanism in North America. So what did and didn't we do yesterday? We did acknowledge (rightly so in my opinion) that a lot of people in North America who identify as Anglicans - whether part of the Anglican Communion or not - are in a very difficult situation right now. We did affirm that ACNA are telling us that they aspire to be part of the Anglican Communion. We did acknowledge that at the simplest level our inclination is to be inclusive. What we did not do is recognise ACNA as anything other than a self-defined group. Unless or until the Anglican Covenant is adopted, that is as far as the Church of England can or will go. The ball is now firmly back in ACNA's court. Do they genuinely wish to be part of the Anglican Communion? Time will tell, and I will watch with interest. 1. 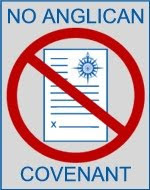 The standing committee of the Anglican Communion said in December that nonmembers (like ACNA) could not sign the covenant at least for now. That is one of the points which caused ABp Mouneer's resignation. 2. The procedure for application as a new province is established, and this has been pointed out to ACNA by the ACO. ACNA has not initiated such an application and does not appear interested in doing so given that The Episcopal Church would have a big say in approval. In a sense, that seems to answer my question. TEC is part of the Anglican Communion. Being in the Anglican Communion means being in communion with TEC. If ACNA can't stomach that then they are looking to join the wrong organisation.